Welcome! Let the games, I mean quilting begin! 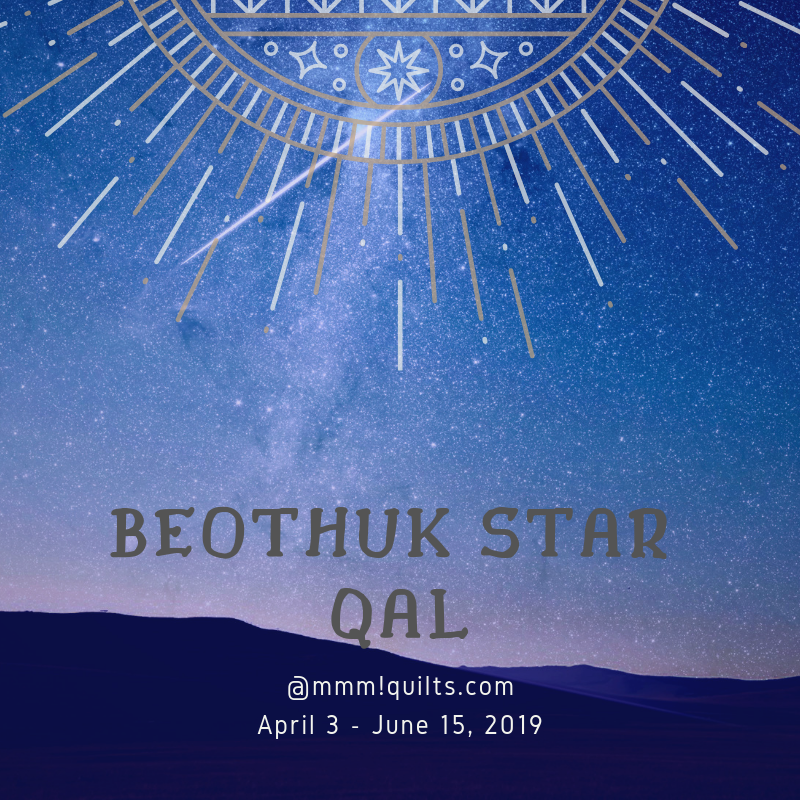 This is the official kick-off to my third annual QAL, Beothuk Star. It's a very simple quilt, much like last year's, with colour placement a key feature. 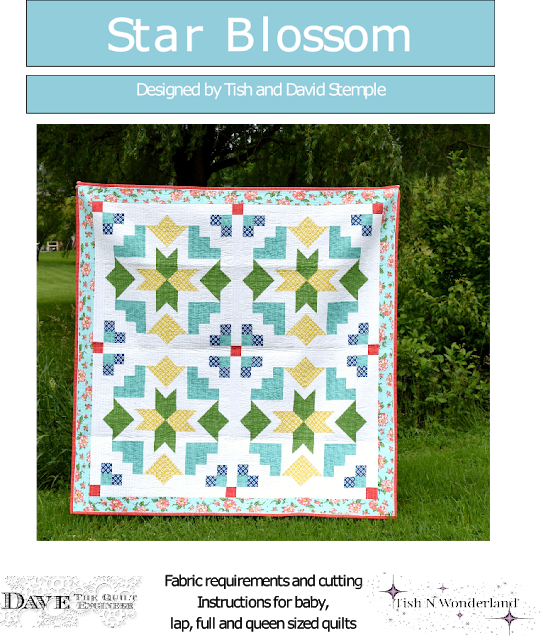 You will find all the instructions needed to make this quilt here on the blog as we progress. At the end of the QAL I will have a PDF pattern which I will give free to those who complete the quilt, as in fully finished useable quilt. The final Linky party will be for all who finish, either a flimsy or a finished quilt. 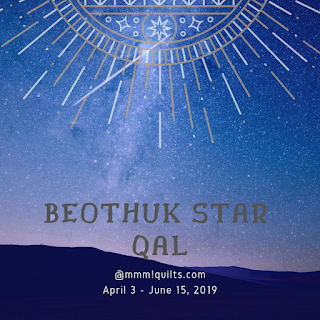 Beothuk Star - note Craftsy took down my pattern so the link in the post won't work. All right, here is the schedule, once again, fairly relaxed, with steps two weeks apart. Remember the quilt is a baby quilt size, 42.5" square. My main sponsor is Needle & Foot Fine Fabrics. Bernie and I 'met' through the New Quilt Bloggers Hop in 2015. We have several things in common, both started sewing at age 12, both the same age, and both are young at heart. We both have a deep love and appreciation for nature, we both have one child living in another country to us (her son in Toronto, my daughter just outside of Detroit), both have one adorable grandchild who sadly lives far away, but we get out to visit and they come to us as often as possible. We both have had a love of fabric (and me of yarn) for most of our lives. Bernie's dad had a fabric shop back in the 70s where she worked part-time, and I worked part-time in Eaton's fabric store in the late 70s. 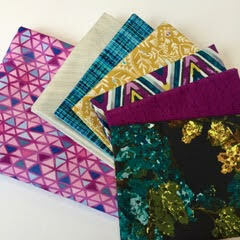 We both love Art Gallery Fabrics, and Bernie stocks a lot of them. bari j is one of our favourite designers. Bernie's shop evolves each year: last year she had bloggers (I was honoured to be among them) curate a Blogger Bundle for eleven months of the year, and that is how she came to be the sponsor for my quilt along, when a random comment was made about 'you should do a QAL, Sandra' said by someone, and I told Bernie, and she said, "Okay! I'll sponsor it!" and here we are. I should mention that Bernie also writes a blog, and a newsletter, available through a signup on her blog. Last year she headed up Spread the Love, a hugely successful campaign to make doll quilts and little hospital gowns for the dolls for kids with disabilities made by A Doll Like Me. This year she is carrying several designers' patterns, and curating kits for them. She has two kits available for my quilt! AND, she's offering a $35 gift certificate to her shop for one winner! If you ordered the original Blogger bundle last November, and you want four different-coloured stars, along with the pop star in the centre, then all you need to do is order the Quit Kit Extension. 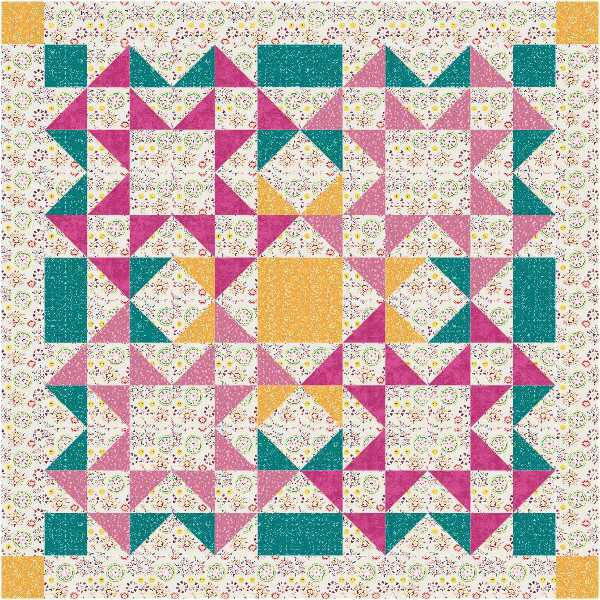 Here is kit #2, one I curated especially for this QAL which you can purchase here. This quilt has enough of the teal for binding. Finally if you purchased the original Blogger Bundle, and you do not wish to purchase more fabric, you will need 1.75 yards of a background fabric from your stash, and you will need binding. 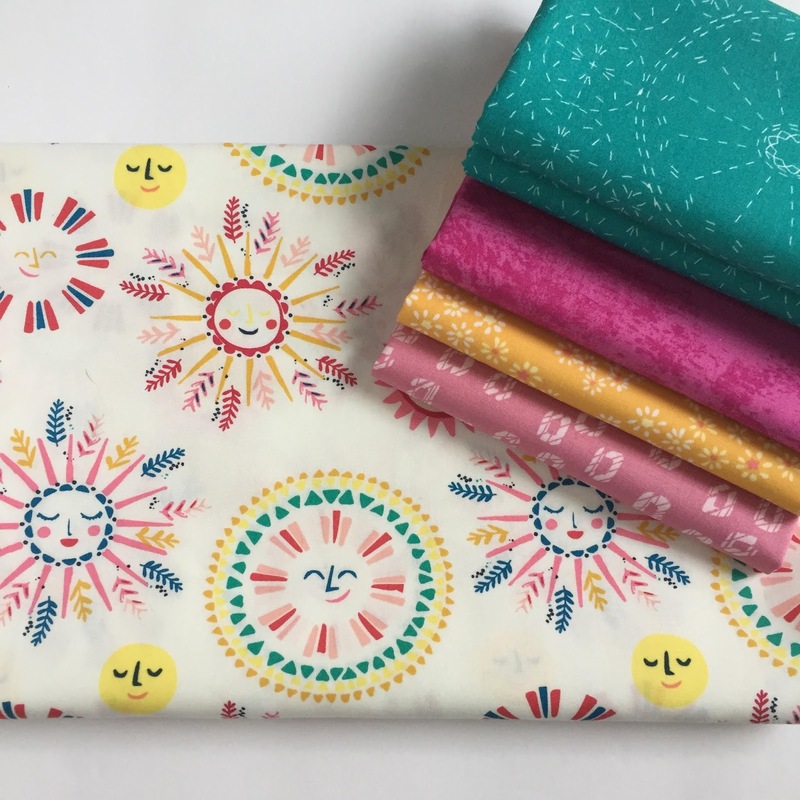 Once you have those fabrics in place, we can make the fat quarter bundle work. 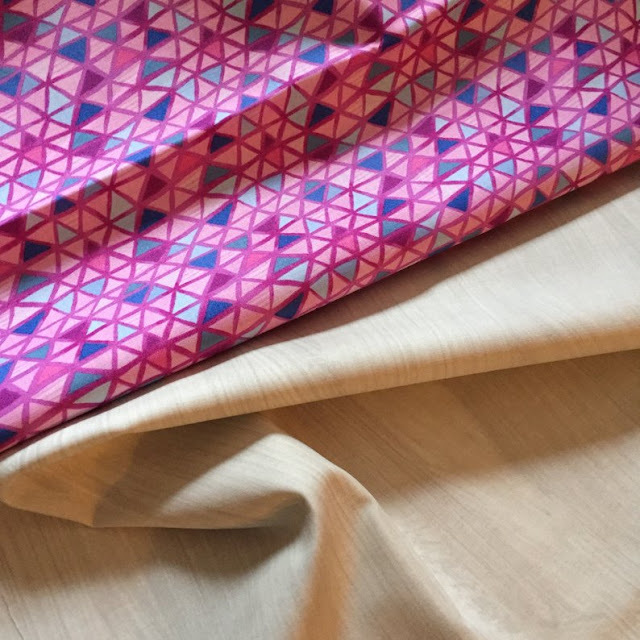 If you purchased a 1/2 yard bundle you only will need more background fabric. Next week I will be back with cold hard.... that sounds most UN-quilty!... Let's make that, I'll be back with warm, soft, exact fabric requirements. 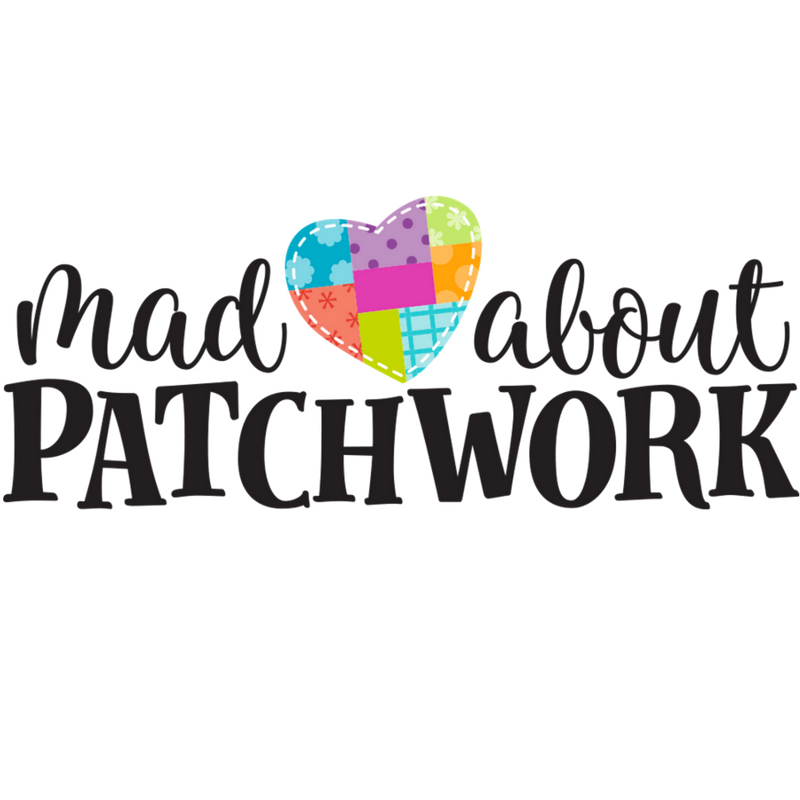 I'm so happy that Mad About Patchwork is back again this year to sponsor my QAL. They are both a bricks and mortar quilt shop located in Stittsville, Ontario, as well as an online one. They are offering a $50 gift certificate to their store to one lucky winner. Canuck Quilter Designs is Joanne, originally Canadian from the Maritimes, now living in Iowa. Joanne began quilting in 2010, and has been designing gorgeous quilts pretty much since that time too! She is offering one prize of two quilt patterns from her shop. Cooking Up Quilts is Beth, who lives in West Virginia. She has been quilting for 16 years, and designing since 2015. You can find her wonderful patterns in her store. 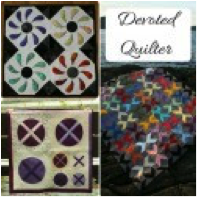 Devoted Quilter is Leanne, who lives in Newfoundland. She has been quilting for 21 years and started designing in 2014. Her first design was published in Make Modern in 2015! She is offering the winner's choice of two PDF pattern downloads. 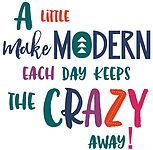 "Make Modern started in 2014 as a collaboration of three Aussie quilters who built a close friendship through the online quilting community. 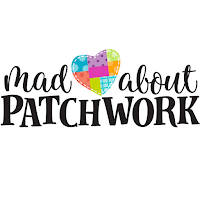 Our magazine is written by a small team of passionate modern quilters in Australia with a huge team of amazing quilters from all over the globe who contribute patterns and articles." Issues come out bi-monthly and contain articles and modern quilt patterns. You can purchase a subscription or a single copy here. Issue #27 just came out, and it's another beauty filled with eye candy and patterns to make said eye candy! Make Modern is offering a 6-month subscription to one lucky winner. 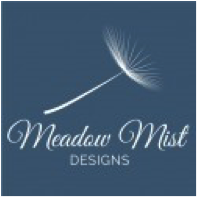 Meadow Mist Designs is Cheryl, one of my most favourite bloggers. 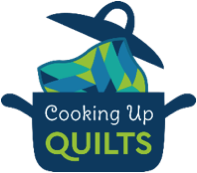 She is an accomplished quilter, designer and author, host of several successful mystery QALs, and lives in South Carolina. By day she is an engineer and patent agent for a private textile and chemical company. She is offering two digital patterns of choice to two lucky winners! 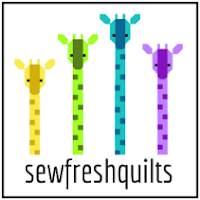 Sew Fresh Quilts is Lorna, well known for her much-loved animal quilts, and popular quilt alongs. She lives just a couple of hours away from me here in Ontario. It's hard to believe she only started blogging in 2012, which was shortly after she started quilting! She is a talented, prolific designer, and she is offering three prizes this year! Each prize is a $25US/$33CA gift certificate to her shop. Stitchin At Home is Cindy, another sister Ontarian who lives just a couple of hours from me. 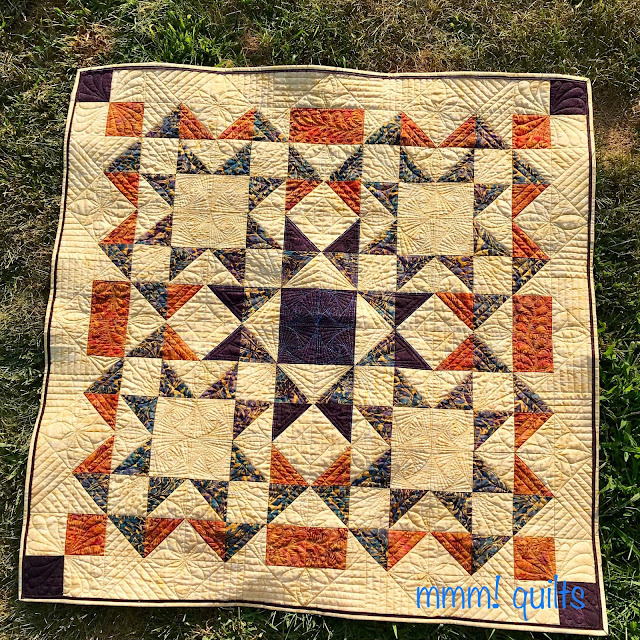 She has been quilting for over 25 years and blogging since 2014. She started designing in 2014, and has published several patterns, both for sale and in magazines. She is offering one lucky winner a PDF of her newest, not-yet-released design! I've seen a couple of glimpses on Instagram, and it looks gorgeous. Happy Birthday to you! We share a great birthday month. Happy birthday, Sandra! Enjoy your day. I enjoyed reading this kick-off for the quiltalong. Happy Birthday, Sandra! I hope you have a wonderful day full of good things! I have my original bundle plus the additional fabric, and I'm ready to go! This is going to be fun. Happy Birthday 🍷🥳. Have my fabric picked. Going Tula Zuma here. Enjoy you day. Happy Birthday, Sandra! I'm ready, and excited, to quilt along with you! The QAL is going to be a great success - Love working with you and look forward to many more collaborations Sandra. Enjoy the yoga, the not stone massage and the cake! Happy Birthday. I'll be watching, but not playing along. I just have too many other irons in the fire right now. Happy Birthday!!! Wishing you a fabulous day and the start of an incredible year!!!!! Happy Birthday. It sounds like you are going to have a great day. Actually, you should celebrate all month! Can't wait to get started on this quilt-along. Happy Birthday Sandra, have a wonderful day with love and sunshine. I have some fab IB strips, and with some added fabric for backing, will use greens and purples.We are in cold morning mode down here, and winter merino will soon be on the menu. Happy Birthday Sandra! I liked how you snuck in this important piece of info. You will always be younger than me. BTW, you should remember my birthday since it's the day before the famous Canadien's. I'm anxious to start the QAL and started looking for fabric and haven't decided yet but I did find three new projects or squirrels instead. Have a wonderful day! Big Hugs! How fun reading about you and Bernie's things in common! I have always been drawn to both you and Bernie since I first started blogging. Must be because we are all the same age! I would love to participate in your QAL but I'm afraid I am getting too many commitments going to justify another one. But I'll be watching!! :) I love seeing all the inspiration on the finish pictures! Looking forward to it! Have a slew of quilts that will be ready for the end of May, so it will be nice to have this one to finish a little later in the year.. I am waffling on fabric choices, but hope to find a lovely background in NH this weekend - Keepsake Quilting!! And Pineapple Fabrics are near our spring fling weekend. And, a very happy birthday to a famous Canadian in her own right! 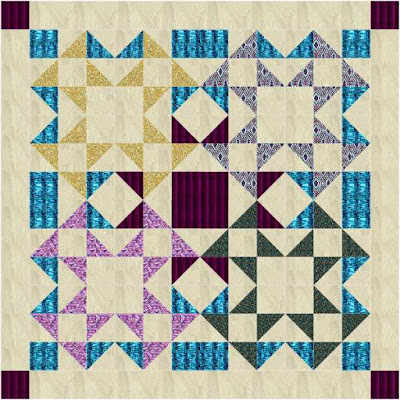 I was initially interested in participating when I saw your pattern on IG, then I decided I was going to flame out with too many QALs, but then I saw your blog post this morning and decided I had to join in the fun! I can't resist the pull - lol! Oops! Sorry to be late! Happy Birthday Sandra!